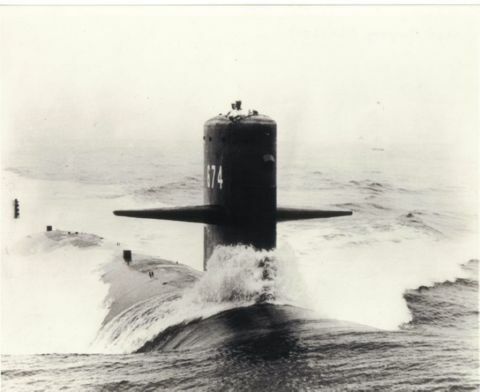 The second Trepang (SSN-674) was laid down on 28 October 1967 at Groton, Conn., by the General Dynamics Electric Boat Division; launched on 27 September 1969; sponsored by Mrs. Melvin R. Laird, wife of the Secretary of Defense; and commissioned on 14 August 1970, Comdr. Dean Sackett, Jr., in command. After returning to New London via Faslane, Scotland, Trepang was soon deployed to the warmer climes of the Caribbean, departing from her home port on 22 April and subsequently making port at Frederiksted, St. Croix, Virgin Islands, for weapons systems acceptance and evaluation trials. Back in New England waters for local operations, Trepang again headed south for further tests. Later in the year, in November, the submarine conducted independent operations in the North Atlantic. Following her return to her homeport on 5 February 1972, she subsequently underwent standdown and upkeep, as well as type training and equipment grooming in local operating areas. During this period, Trepang again conducted a second extended deployment into the northern Atlantic from 24 July to 25 September 1972, returning to New London via Halifax, Nova Scotia. For the remainder of the year, Trepang operated off the east coast between New London and Ft. Lauderdale, Fla.
An interim four-week drydocking period at the Portsmouth (N.H.) Naval Shipyard preceded the ship's 1973 operations, before the attack submarine headed south for weapons tests off the Florida coast. Completing a four-week upkeep period on 22 April, the ship completed a Nuclear Technical Proficiency Inspection before returning to New London, where she completed an Operational Reactor Safeguards examination on 4 May. On 8 June, Trepang departed New London for a six-month deployment with the 6th Fleet in the Mediterranean. She participated in several special operations with this Fleet during the increased tension brought on by the Yom Kippur War in the Middle East in October 1973. The attack submarine returned to her home port at the end of November 1973 for upkeep and standdown leave period. Trepang got underway on 15 February 1974 for a special operation which lasted through 9 April. The ship then spent three days at Holy Loch, Scotland, before sailing for New London. She continued local operations and training off the east coast through her change of home port on 1 October 1974, when the submarine was assigned to Portsmouth, N.H. She spent the remainder of the year 1974 in drydock in annual overhaul. Trepang was assigned to Submarine Squadron 10 during March 1975. She spent the period from April to August completing the overhaul and carrying out crew training and recertification. Following sea trials in late October, Trepang returned to New London on 7 November for an intensive post-overhaul upkeep alongside Fulton (AS-11). Departing New London on 1 December, Trepang conducted post-overhaul weapons systems acceptance testing at Roosevelt Roads, Puerto Rico, and five days of acoustic trials off Frederiksted, St. Croix, Virgin Islands, before departing St. Croix on 17 December and returning to New London on 22 December. Trepang spent the early part of the year 1976 preparing for an extended cruise. She deployed to the Mediterranean from June to November, operating with the 6th Fleet. She returned to New London upon conclusion of the deployment and observed post-deployment standdown into 1977. In mid-January 1977, Trepang participated in Exercise "CARIBEX 77." The spring was devoted to individual ship exercises which included a Nuclear Technical Proficiency Inspection (NTPI), a Mk-48 Torpedo Proficiency Inspection, and an Operational Readiness Inspection, all of which were completed successfully. An extensive refit period, which included drydocking, took place in May and early June. Midshipman orientation cruises followed; and, in September, Trepang conducted pre-deployment work-up and certification. The nuclear attack submarine then engaged in an Atlantic training mission from mid-October to mid-December with the ship returning to Groton in time for Christmas. January 1978 found Trepang finishing a post-deployment standdown. The remainder of January, February, and March were devoted to type training and participation in NATO Exercise "Safepass." Trepang spent the summer working up for a scheduled Mediterranean deployment. The deployment was subsequently cancelled to permit the ship's participation in a special CNO project. The remaining months of 1978 were spent in the evaluation of project-associated equipment, with alternate periods at sea followed by periods in port devoted to equipment maintenance. Trepang departed Groton on 27 November to conclude the year at sea while continuing to participate in the special project.